Miracles by the Lancetta's power handling shouldn't be expected; this speaker is well suited for a moderate volume, not for much more. The Tangband W 3-871 (pictured left) is just 9.4 cm in diameter, using a aluminium phase plug for cooling, while the cone is made of paper. The Tangband full range driver possesses a relatively high Q factor, meaning that on paper a larger cabinet could be used or the bass is slightly emphasised, similar to CT 209 With this in-house competition Bernd Timmermanns wasn't happy. Looking for more suitable application he came up with the logical idea to put the Tangband in a transmission line, where relatively weak driver magnets are required. Additionally, in this type of enclosure the Tangband operates far below resonance frequency. 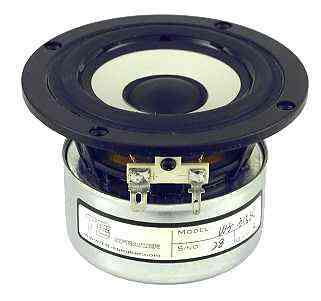 To achieve a more even frequency response two Helmholtz resonators were put into the enclosure, just above the driver. The Lancetta consists basically only of exterior walls, since there is only one channel, ending near the base. Please note: Per cabinet 2 x drain pipes with 46 mm diameter and 60 mm length are needed. Available at the local hardware store or from us for EUR 10.00 (pipe for 4 pipes / a pair of speakers). Money saving hint: Marginally cheaper is a 1.0 mm coil instead of a 1.4 mm. As result you get a bit more kick bass and save EUR 2.40 per cabinet. This version contain per unit 2 x binding post and 2 metre cable with silver plated copper wire 2 x 2.5 mm2. 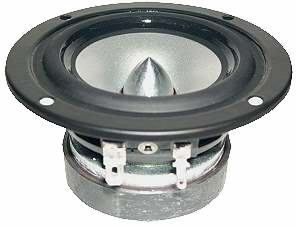 For a somewhat livelier and brighter sound we recommend the W3-315SC with aluminium cone.